"Chorus", Samsung Group Play Alternate app for Every device! Don't you have Samsung Galaxy S4 but want its Group Play feature in your device? If yes then you are at right place. Samsung Group Play is one of the best feature of Samsung Galaxy S4, the feature used to play one song on different mobiles on same timings. I was just visiting XDA Developers and I saw a new application release named Chorus. The app fulfilled my dream of Group Play feature in my device. Okay, if you haven't heard or used Sasmung Galaxy S4 then let me tell you about its Group Play feature. The Group Play feature was introduced in Samsung Galaxy S4 with its release which allows users to play a single song on other devices (Samsung devices only) by wireless network. This application is just a copy of that application, not a copy but does the same work, but better work. There are no restrictions on the device vendor, also it doesn't require any special feature or hardware requirements but just a WiFi modem which will allow you to sync your music with other devices. With this application you can turn out your Android devices to a loud speaker because it can be played in many devices simultaneously. I tried this application on my friends and my devices like Samsung Galaxy S3, HTC One Mini and Micromax A117 Canvas Magnus and it was really like a loudspeaker. I was totally impressed with the application and so tough to write an article for this application on my blog. The application is developed by XDA member rahuliyer95 and he has got many thanks and comments for his fantastic application. Chorus supports each and every device which uses Android 2.3 Ginger Bread or above. It also uses the same feature as Samsung Group play does, by creating WiFi hotspot to share Play List with the other device. The host device creates a hotspot, to which other devices using this application can connect to and play the same song on his/her device. Because of WiFi (faster than other networks) the song won't lag and will run flawlessly on even slow routers too. You can create unlimited play lists and share it with your friends or any other person. He/she just needs a simple 'password' or a 'key' which you will see when you will make your play list so they can connect you. No Ads or Adfree: the application doesn't show any kind of ads like AdSense or any other ads so you don't need to use applications like AdBlock or other ad blocking applications. 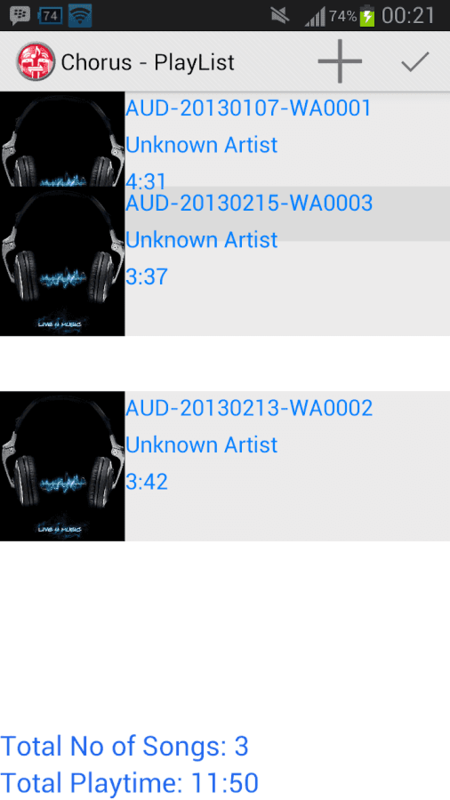 The list can be edited any time: You can edit your play list any time and can re-sync it afterwards. Manual Sync option is available: Don't want automatic syncing? Then great because you can also use Manual Sync option in this application. Edge cutting UI: The application has a HOLO themed UI and there are nice animations with it too. Connect millions of devices: If you want to connect your 3, 4 or even 20 devices, then you can connect them easily by using this application and don't need to worry about the number of devices. Supports Android 2.3 Ginger Bread or above: There are many people who still uses Android 2.3 GingeBread or Ice Cream Sandwich in their devices so the application is available for them too as well as for JB/KK too. There are many features which you may explore after installing and using this application only! What are you waiting for? Download the application straight-away on your Android device! Excellent concept with a great implementation! This app is awesome! Yes, this is a nice application. I was also impressed with it when I used it for the first time.